The Yksion Elite Allroad tires are built to handle gravel or paved riding with grooved shoulders and a slick center tread. A supple 120 TPI casing helps smooth out rough rides, and a bead to bead nylon breaker increases puncture resistance. 700c x 30 mm. Tubeless compatible. Claimed weight is 330 g.
I bought this tire to train for and ride the Belgian Waffle Ride, a 133 mile ride with a mix of road (90 miles) and graveldirt (40 miles). At first look I did not expect great performance on the dirt with the little tread, but I was pleasantly surprised. I ride a very high tire pressure (nearly maxed these at 80 psi) and still set a KOM on a Strava dirt segment on my first day with them. I had read some other reviews that they are not great in wet conditions (I am in San Diego, so I can not review that), so I assumed that they would give up some grip on the road in dry conditions. They don't. These tires are sticky and will grip dry pavement while cornering harder than I am willing to go. As an all-around tire leaning toward road use, these are a very capable tire. The downside to these tires is how quickly they wear. I didn't pay much attention until I got my first flat at 750 miles. Then I noticed that my rear tire had worn all the way down to the casing. Which means that its useful life was probably actually around 600 miles. By that point in training I didn't want to search for another tire, so I bought another set. I rotated them after about 400 miles, but still only got about 1,100 miles out of the set. My bike I combined are almost 200 lbs and I ride pretty aggressively in dirt, so I am not easy on tires, but I am not willing to spend $65tire every 1,000 miles. So I won't buy them again. If you don't mind paying that, or are looking for a race tire, then these are the tires for you. If you are on a budget or just can't put up with that kind of wear, find another tire. These came on a wheel set, so they stayed on the rims for a shake down ride. At first they seemed to be just what was needed. Excellent on both pavement, and gravel. Before the first week was over the front was flat'd by a mm sharp stone, and by the second week a rear flat as well. Now their in the dumpster. When searching for gravel tires, I had a very specific size (28-30mm) and need - some pavement and hardpack dirtgravel - and these seemed to fit the bill. I set them up with tubes first to make sure they would fit, then went tubeless after the first ride. These tires rock. on pavement at 60psi, they roll quick with only a hint of being sluggish at the top of a steep roller. On hardpack dirt and packed gravel at 45psi, excellent rolling and surprisingly good grip. Also, excellent grip on wet pavement. I bought these tires for a ride that I will be doing that is 100 miles on the road and 40 in the dirt combo of gravel roads, single track, sand, etc. After 200 miles of training rides I am sure that I have the right tire. They are capable in the dirt - far more than I would have expected when I first saw the tread. They are decent on the road, allowing 85psi for lower rolling resistance and reasonable handling. This tire is not great at anything - I would not corner too hard on roads and I occasionally get some spin on hard climbs in the dirt. But it is not a road or dirt tire, it is a good combination of the two when you plan to do a whole lot on the road. If you are looking for a good combo tire that is more about the dirt and is reasonable on the road, I would recommend the WTB Nano 40c. I like it more than this Mavic for everything except rolling resistance. At a max of 50psi I just couldn't see slogging 100 miles on the road on it. 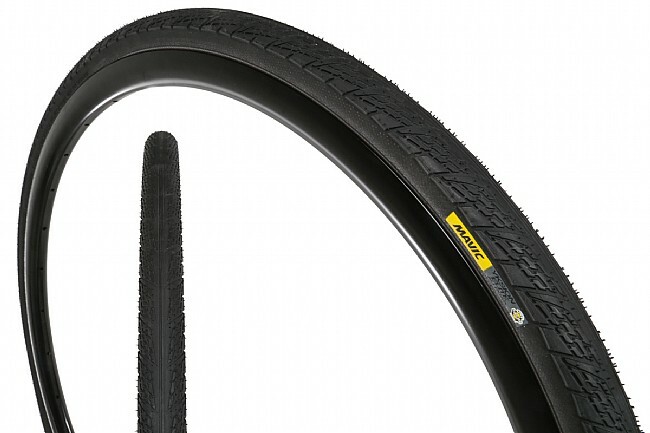 The Conti 4 Season 700x32's I had bought did not have enough clearance between my bike's chain stays, so I ordered one of these thinking its 700x30 sizing would leave sufficient space. Wrong! When mounted, it was WIDER than the Conti 32's on my 17.5mm ID rims, and actually measured close to 33mm. I called Mavic, they mounted one on a wheel, and they got 32mm width. Not sure why they are marketed as 30mm. I like the tread pattern for my purpose (gravel rail-to-trail and paved roads) and an actual 30mm width would be useful for situations like mine. A pity, I had to return it.